For me, the joy of cruising includes literary adventures. Not my kind of wordsmithing, but the cruising guidesmost written by friendsthat help boaters understand and safely navigate waters from Mexico to Southeast Alaska. These volumes describe ports of call, identify the best anchorages, offer advice on powering through difficult passages, and in general provide huge volumes of welcome information. 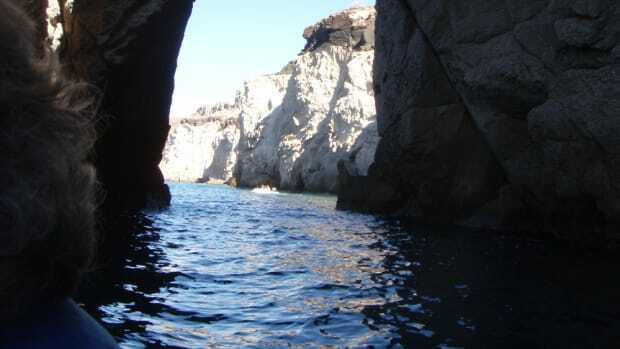 Others, less important to the safety of a voyage but equally interesting, focus on identifying plants and trees, birds, fish, whales, and other critters of the sea and describe places and things to see ashore. There are too many guides to describe in detail here. But two books I enjoy the most, neither written with cruising boaters in mind, may come as a surprise. One is John Muir&apos;s Travels in Alaska, which describes his study of the glaciers in Southeast Alaska in the late 1880s. Muir, not a formally trained scientist, taught degree-holding scientists the importance of glaciers in the formation of the world we know today. It&apos;s fascinating to join him as he packs a bag with tea and oatmeal and sets out on foot for days of hiking up, across, and around glaciers. Equally compelling are his descriptions of navigating Alaska waters on steamships and in Indian dugout canoes and using dogsleds for crossing snowfields. An old volume new to me this year is John Steinbeck&apos;s The Log from the Sea of Cortez. Steinbeck, known best for fiction, including Of Mice and Men, The Grapes of Wrath, and East of Eden, was interested in marine science and had scientist friends. In 1940 he spent six weeks on a 75-foot fishing vessel helping collect specimens from the shore of Mexico&apos;s Baja California. The initial book detailing the expedition, Sea of Cortez: A Leisurely Journal of Travel and Research, was well received but got little early recognition because of its release date: Dec. 7, 1941. The book included Steinbeck&apos;s words and the writings of his friend and partner in research, Edward Ricketts, describing all the shoreline creatures collected on the trip. The Log from the Sea of Cortez, published in 1951 and the version available in many bookstores today, contains only Steinbeck&apos;s contributions. I found a paperback version of The Log from the Sea of Cortez aboard Ursa Major, a Malahide North Sea trawler, while cruising in the Sea of Cortez early in November. The 65-foot wood yacht is owned by Joyce Gauthier, a Seattle-area physician and a friend since we met while I was researching the Malahide fleet nearly a decade ago. Ursa was in Mexico before her charter season began, and Joyce invited my friend, Ellen Kaiser, and me to come south for warmth and good cruising. Steinbeck cruised the same waters and anchored in some of the same harbors as did Ursa Major, and it was fun to read his descriptions while making my own observations. As soon as I got home, I bought a copy of the book. In 1940, Steinbeck found fishermen using dugout canoes. (Where did they find trees? Rocky Baja grows brush.) They often lived in tiny, lonely huts on the shore. We found fishermen working from pangas, open fiberglass boats of 18-20 feet and powered by outboard motors. We visited two fishing villages: at Bahia Aqua Verde, 33 miles south of Loreto, and at Isla Pardito (also known as Isla Coyote), which is about 50 miles north of La Paz. Families in both places lived in small houses somewhat better than the huts Steinbeck observed. At Aqua Verde they were of concrete block, with a few small windows and a door. Built by the government, the houses probably had less space than a single-car garage. A water reservoir was on each Aqua Verde rooftop. I saw plastic pipes leading to a building on a hill, indicating that a water supply existed, but I couldn&apos;t imagine a source in that dry, rocky land. At Isla Pardito, rows of plastic containers indicated that residents haul water from the mainland. We anchored nearby and took the tender to shore, where a team of men was butchering skate on a shoreside table shaded by a tarp and hanging the flesh on lines to dry in the hot sun. A crumbling churchconcrete and mortar seem not to survive in Bajaat the top of a steep, rocky path offered a stunning view of the Sea of Cortez. At Aqua Verde the fishing families live inland a bit from a beautiful beach lined with pangas, with a postcard-perfect bay beyond. We stepped into a cool, dark store the size of a home and bought its last five tortillas for dinner. A steep, rutted, rocky, four-wheel-drive type of road leads 22 miles to Mexico Highway 1, which runs the length of Baja. Trucks come from La Paz to collect fresh fish. Buyers don&apos;t seem to mind that there is no ice for chilling the fish. Steinbeck and crew collected specimens from along the shore at Bahia Aqua Verde, but he didn&apos;t mention a fishing village. It probably didn&apos;t exist then. He doesn&apos;t mention Isla Pardito. For entertainment at night, Steinbeck did what we also diddropped a light close to the water&apos;s surface and watched the hordes of fish drawn to it. Steinbeck and Ricketts collected specimens. We did not, although some of the smallest clung to our lamp and were hauled aboard. We swam several times a day and snorkeled often to watch thousands of fish swim below. Some were so transparent they were almost invisible. Others shone in vivid red, yellow, and black. On one islet, young California sea lions swam out to greet us. We saw one whale (we were too early for more), and on another day a fleet of southbound manta rays passed northbound Ursa Major, the upright tips of their wings slashing grooves in the sea. We watched for Sally Lightfoot crabs, gaily colored creatures that skitter across rocks just above the waterline. Brown pelicans entertained with their intense fishing tactics: at 20 feet or so in the air, they would drop a wing, tip, and plunge head first into the sea in an ungainly splash. They were successful occasionally, gulping down their catch as they popped back to the surface. I sense that Steinbeck and crew found fish more abundant; they saw many species and fished incessantly, catching food for the table: bonito, dolphin, sierra, red snapper, tuna, and more. To accompany the fish, they made "thousands of big, fat biscuits, hot and unhealthful." Today, national parks and conservation areas protect wildlife and island areasto an extentbut we heard a lot of worry about government plans to allow long-line fishing. Opponents said miles of hooked lines would inadvertently catch, and perhaps destroy, runs of turtles, sharks, and other species not destined for market. There was no fresh water for laundry or bathing on Western Flyer, the sardine boat on which Steinbeck and crew traveled. "On board we went barefoot, clad only in straw hats and trunks," Steinbeck wrote. "It was easy then to jump over the side to freshen up. "Our clothes never got dry; the salt deposited in the fibers made them hygroscopic, always drawing the humidity. We washed the dishes in hot salt water, so that little crystals stuck to the plates. It seemed to us that the little salt adhering to the coffee pot made the coffee delicious." On Ursa Major, we hosed off with warm fresh water after swimming. There never was salt in our morning coffee. Steinbeck complained that charts available in 1940 showed the outline of the Baja peninsula, but not much else. That&apos;s generally true today. Electronic charts may be misleading because of early charting errors. 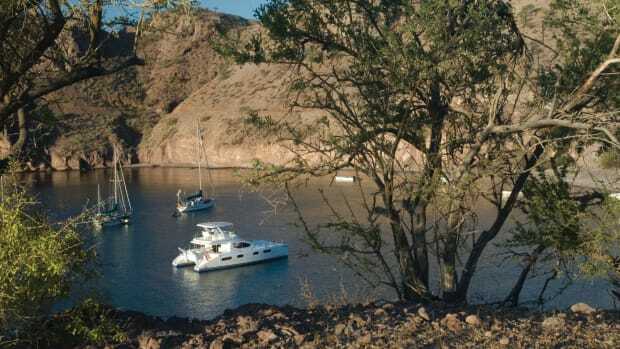 Our professional skipper, Josh Haury, maintains his own log of depths and hazards in popular anchorages and also relies on charting work by Shawn Breeding and Heather Bansmer, sailboaters and authors of the newest guide to Sea of Cortez cruising, Sea of Cortez: A Cruiser&apos;s Guidebook. The Western Flyer crew drove stakes near the shore and topped them with a flag to gauge tidal action. They anchored far off shore to stay in deeper water (and to avoid biting flies found close to the beach). The captain of Western Flyer was wary, as is Josh, who has electronic navigation equipment that would have been deemed unbelievable 70 years ago. Four years of charter work in the Sea of Cortez also has given him good local knowledge. In Loreto and La Paz, Steinbeck&apos;s group found men and boys sitting on the beach. As they dropped anchor, several men walked away and reappeared in official uniforms to conduct customs and immigration work. Both towns were old and small, and Steinbeck made note of a crumbling church. Today, both towns have a broad, tree-lined boulevard (a malecÃ³n in Spanish) along the shore. La Paz has a collection of spectacular bronze sculptures along its malecÃ³n. Steinbeck said little about touring either town, but Ellen and I walked with Josh and his wife, Emily Waschak, along a cobblestone road in Loreto, not far from the beach. It was bordered with trees spreading a green canopy over pedestrians. I called it the "street of dreams" because it was lined with shops carrying tourist goodsvividly painted pottery, fabrics, silver jewelrybut there were no customers. Loreto suffers from the collapse of a huge residential housing project. Developers promised several thousand homes and golf courses. They delivered a hundred or so homes and a single course before crashing financially. An outdoor café was open, and it served us cheese quesadillas, Pacifico beer with lime, and Mexican Coca-Cola, which is sweetened with sugar, not corn syrup. Both beverages were superb. While Steinbeck met people of old Mexico, we had the pleasure of spending time with a young couple who represent today&apos;s MexicoEduardo and Elizabeth Roa. He&apos;s a graphic artist and she&apos;s a chef. Together, they were preparing to open a coffee shop and roaster in La Paz. At their request, we did a taste test to compare their roasted coffee with Tully&apos;s (my favorite brand at home). They were both winners: Tully&apos;s French roast is rich and strong, while Eduardo&apos;s roast is light and flavorful. Elizabeth and Eduardo were guests aboard Ocean Quest, a 68-foot Romsdal trawler owned by Bill Lee, and they prepared dinner one night while the two yachts were side by side on a single anchor. She prepared a smooth Azteca soup, blending tomato broth, mild chile ancho, fried tortillas, chicharrÃ³n (pig skin), cream, and avocado. Their menu included two kinds of chicken tortillassalsa verde and mole from Vera Cruz with cheese, and vegetable and beef tamales. They served a special release of Nocha Buena beer. It was a four-star meal and evening. Steinbeck did not dine as well on Western Flyer. He had one memorable lunch, however, when he accepted an invitation to accompany a hunting party into the hills above Puerto Escondido. Describing the meal, he wrote, "It is made in this way: a warm tortilla is laid down and spread with well-cooked beans, and another tortilla laid on top and spread, and another until it is 10 or 12 layers thick." Sliced and served, "It is a fine dish and very filling," Steinbeck wrote. You&apos;ll find almost anything in good old books.